Missouri Brussels Griffon Rescue View other Brussels Griffons for adoption. NBGR is pleased to introduce Trixie & Lexi - our irresistibly cute and cuddly mother/daughter snuggle bunny duo. This adorable very bonded mother-daughter pair is looking for a calm quiet adult only home with at least 1 female where they will be loved and pampered forever and ever. In return, these little ladies will shower their new family with a kind of love, devotion and gratitude unlike anything you have ever experienced! Trixie is 11 years old and 15 lbs. - Lexi is 8 years old and 12 lbs. Both are very healthy and active. Because Lexi is a definite flight risk, they will require a home with very secure 6 ft. privacy fencing to allow them to safely explore outside off lead - something they never experienced in their dreadful former life as breeders in a Mississippi puppy mill, and is now one of their very favorite activities every day! 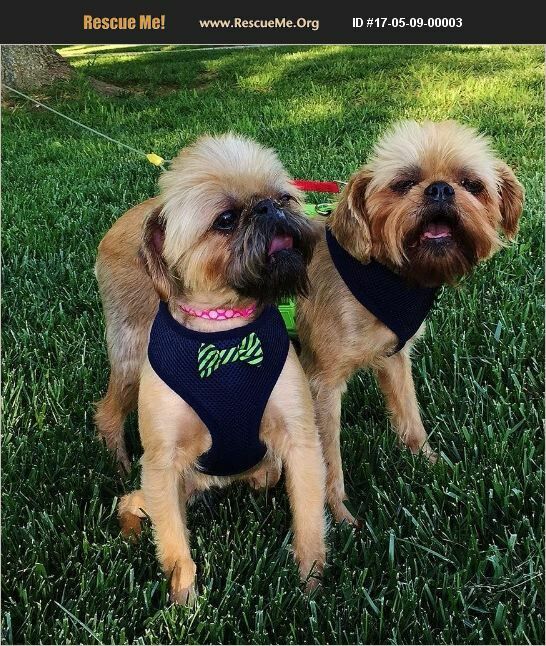 Since being released from the puppy mill the girls have come a long way in acclimating to their new life. They are 98% reliably house trained during the day as long as they are allowed to go outside every 2-3 hours. They would love to sleep in the big bed with their new family, just as they are doing in their foster home. They do fairly well on lead if they are walked together on a leash coupler, and are polite car riders in the back seat attached to the seat belt with a doggy safety belt. They completely relax during bath time if they are gently massaged, and stand very patiently when groomed. As the girls are learning to trust people and savour all the attention they receive, they remain very dependent on each other, and no doubt will be for the rest of their lives. When sleeping they can always be found on one of the dog beds curled up with each other. If one approaches for attention, the other is not far behind - where one goes - the other is sure to follow. Both girls have been spayed, all vaccinations are up to date, they've had recent dentals, complete blood panels, are heart worm negative, on monthly heart worm preventative, and micro chipped. All they need now is your love! We always give preference to adoption applications from families who live within reasonable driving distance of where the dog is being fostered because if for any reason the placement does not work out, it is less stressful for the Griff to be returned to the foster family that dog has previously bonded with. However, if an applicant from outside the area is approved to adopt, they must drive to where the dog is being fostered. We never ship our rescued Griffs, or allow them to fly via cargo. We never place dogs in homes reliant on electric or invisible fencing to contain pets. Fencing of this type may or may not keep a dog in the yard, nor does this type of fencing protect pets from predators, free roaming dogs, or people who may enter the yard. Should there be a power outage, the fence would be rendered useless. If a pet were to panic and run through the barrier and take an electrical jolt from the fence, that pet would not be inclined to return home, and could be lost forever.